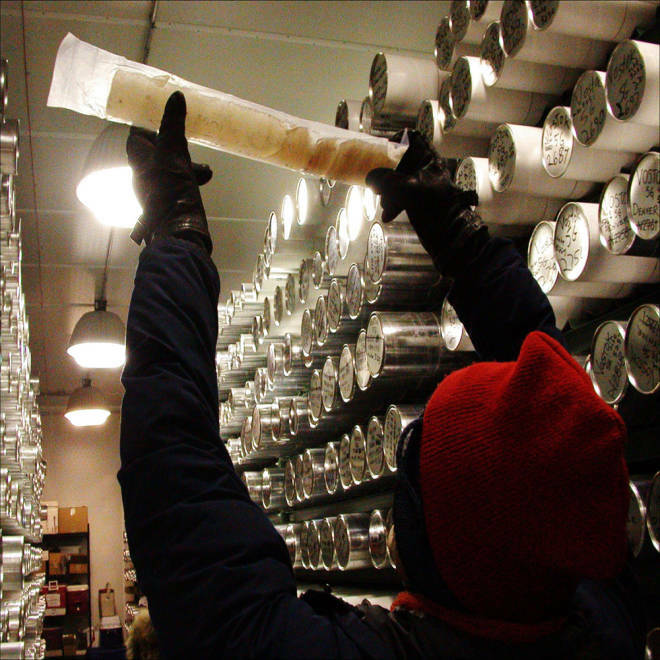 Ancient ice cores are stored at the National Ice Core Lab in Denver, Colo. A new study looked at ice and soil cores from around the world to conclude that carbon dioxide levels were followed by rising temperatures at the end of the last Ice Age. A scientific paper published Wednesday aims to undermine an argument used by some who are skeptical of a connection between warming temperatures and rising carbon dioxide, but those skeptics weren't budging. Published in the peer-reviewed journal Nature, the study concluded that during the end of the last Ice Age, some 12,000 years ago, global temperatures rose after carbon dioxide levels started to rise. Earlier data using temperature records from Antarctic ice cores indicated that temperatures rose before C02 took off -- raising questions in the minds of some about how CO2 could then be blamed for warming, either then or over the last century, when emissions from manmade sources have skyrocketed. For the new study, which was funded by the National Science Foundation, researchers reconstructed temperature records from ice and soil cores at 79 other sites around the world and from around the same time period. "That would end the argument," lead author Jeremy Shakun, a Harvard researcher, told msnbc.com. "It doesn't hold up." Changes in Earth's orbit are thought to have triggered the warming trend by causing ice sheets to melt, but the researchers said the new study suggests C02 played a far more important role -- with C02 previously locked up under sea ice escaping out to add to the existing level. "The paper is based on many assumptions without supporting data," Whatsupwiththat.com quoted Don Easterbrook, a geology professor emeritus at Western Washington University, as saying. University of Oslo geologist Tom Segalstad was quoted as citing a 1992 study that questioned any data from ice cores. Shakun, for his part, said that "our study bolsters the consensus view that rising CO2 will lead to more global warming." "CO2 was a big part of bringing the world out of the last Ice Age, and it took about 10,000 years to do it," he said in a statement released with the study. "Now CO2 levels are rising again, but this time an equivalent increase in CO2 has occurred in only about 200 years, and there are clear signs that the planet is already beginning to respond."